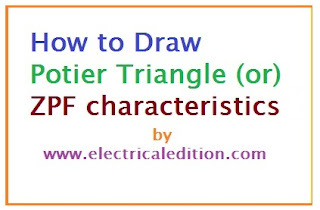 How to Draw Potier Triangle/ZPF Characteristics ? During the operation of the alternator, resistance voltage drop IaRa and armature leakage reactance drop IaXL are actually emf quantities and the armature reaction reactance is a mmf quantity. To determine the regulation of the alternator by this method OCC, SCC and ZPF test details and characteristics are required. -As explained earlier OC and SC tests are conducted and OCC and SCC are drawn. -ZPF test is conducted by connecting the alternator to ZPF load and exciting the alternator in such way that the alternator supplies the rated current at rated voltage running at rated speed. -To plot ZPF characteristics only two points are required. One point is corresponding to the zero voltage and rated current that can be obtained from scc and the other at rated voltage and rated current under zpf load. -This zero power factor curve appears like OCC but shifted by a factor IXL vertically and horizontally by armature reaction mmf as shown below in figure. -By suitable tests plot OCC and SCC. Draw air gap line. Conduct ZPF test at full load for rated voltage and fix the point B. -Draw HD parallel to the air gap line so as to cut the OCC. Draw DE perpendicular to HB or parallel to voltage axis. -Now, DE represents voltage drop IXL and BE represents the field current required to overcome the effect of armature reaction. 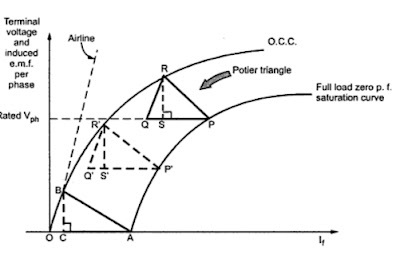 -Triangle BDE is called Potier triangle and XL is the Potier reactance. Find E from V, IRa, IXL and . -Use the expression E =√ (V cos Ø+ IRa)² + (V sin ) + IXL)² to compute E. Find field current corresponding to E. Draw FG with magnitude equal to BE at angle (90+ ) from field current axis, where is the phase angle of current from voltage vector E (internal phase angle). -The resultant field current is given by OG. Mark this length on field current axis. 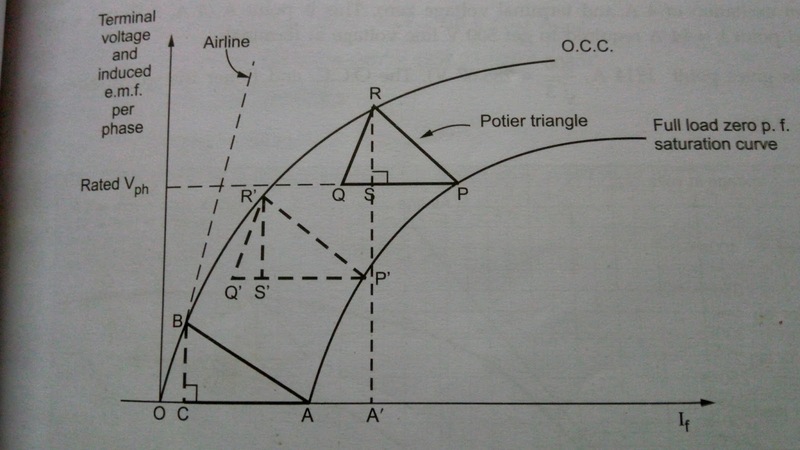 From OCC find the corresponding E0. Find the regulation. 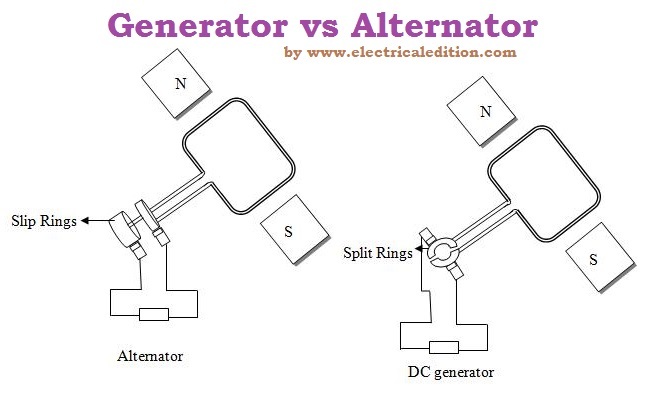 What is meant by synchronization of alternator? Connecting a group of alternators parallel to a bus bar and the alternators should have same voltage and frequency as that of bus-bar. This is called synchronization of alternator. 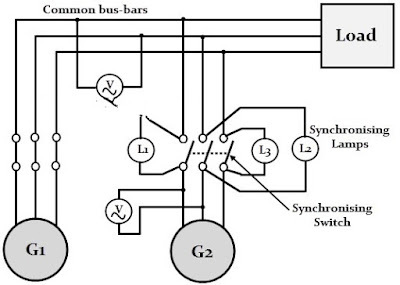 There are some conditions to be satisfied by the alternators which are to be connected in parallel to bus-bar to be in synchronization. 1. The terminal voltage of incoming alternator must be equal to the bus bar voltage. 2. The frequency of voltage generated by incoming alternator must be equal to busbar frequency. 3.The phase sequence of the three phases of the incoming alternator must be same as phase sequence of bus-bars. 4. The phase angle between the voltage generated by incoming alternator and voltage of bus-bar must be zero. 5. Always connect running alternator to bus-bar. If a stationary alternator is connected to bus-bar it will result in short circuit of stator winding. The above conditions are to be satisfied by alternators to satisfy synchronization. Why synchronization of alternators is necessary? 1.An alternator cannot deliver power to electric power system until its voltage,frequency,phase sequence and other parameters matches with the network to which the the alternator is connected. 2. The case of synchronization arises because we are connecting many alternators in parallel to supply the demanded load. 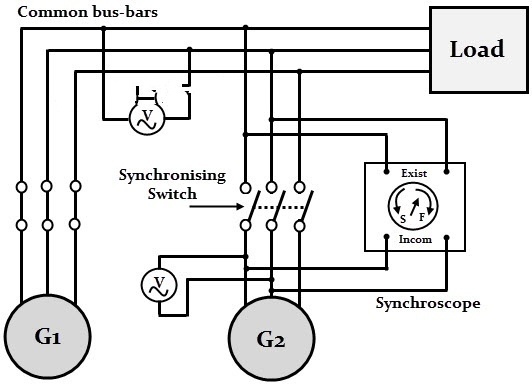 So we need to match all the parameters of connected alternators with bus-bar to deliver power to load. 3. By synchronization we can match all the parameters of one alternator with the other alternator and also with the bus-bar and deliver the required power to load. 4. Synchronization of alternator is also called as paralleling of alternators. In case of any damage to one of the alternators it can be removed.Supply to load is not interrupted because other alternators can supply the required load. But if u use a larger single unit even a small damage causes the interruption of supply. As the load demanded is not same all the time, during light load periods we can run two or three alternators in parallel. When the demand is high we can add the required amount of alternators in parallel to meet the load demanded. Several single units connected in parallel is more reliable than single larger unit because if a single unit gets damaged it can be removed and its work is compensated by other units which are running. An alternator runs efficiently when it is loaded at their rated value. By using required number of alternators for required demand i.e, light load or peak load we can load an alternator efficiently. So because of above advantages we use paralleling of alternators. 1.Consider an alternator-1. It is supplying power to bus bar at rated voltage and frequency. 2. Now we need to connect another alternator let it be alternator-2 in parallel with the alternator-1. In order to match the frequency of alternator-2 with the frequency of bus-bar or alternator-1 (since alternator-1 and bus-bar are already in synchronism) we need to adjust the speed of alternator-2. Now the voltage of alternator-2 is to be matched with the voltage of bus-bar or voltage of alternator-1 (since alternator-1 and bus-bar are already in synchronism). For this purpose we need to vary the field rheostat until the voltage matches. 3. The three phase voltages generated by alternator must be same as the three phase voltages of bus-bar or alternator-1(since alternator-1 and bus-bar are already in synchronism).This can be achieved by matching the phase sequence and frequency of alternator-2 with bus bar or alternator-1(since alternator-1 and bus-bar are already in synchronism) phase sequence and frequency. By following these steps synchronization of alternators is possible. There are three methods for synchronization of alternators. These methods check whether the above mentioned conditions for synchronization of alternators is satisfied or not. The three methods are. 1. Three dark lamps method. 2. Two bright, One dark method. 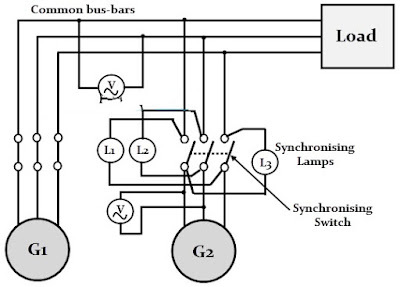 Let us study synchronization of alternators using three dark lamps method in detail. 1. Consider alternator-1 is supplying power to load at rated voltage and rated frequency which means alternator-1 is already in synchronism with bus-bar. 2. Now we need to connect alternator-2 in parallel with alternator-1. 3. 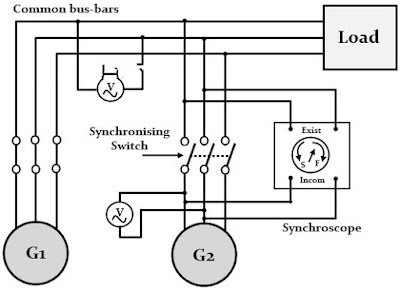 Across the 3 switches of alternator-2 three lamps are connected as shown in the figure. 4. To match the frequency of alternator-2 with the bus-bar frequency we need to run the prime mover of alternator-2 at nearly synchronous speed which is decided by the frequency of bus-bar and number poles present in alternator-2. 5. To match the terminal voltage of alternator-2 with bus-bar voltage we need to adjust the field current of alternator-2 until terminal voltage of alternator-2 matches with the bus-bar voltage. The required value of voltage can be seen in the voltmeter connected to bus-bar. 6.To know whether the phase sequence of alternator -2 matches with the bus-bar phase sequence we have a condition. If all the three bulbs ON and OFF concurrently then we say the phase sequence of alternator-2 matches with the phase sequence of bus-bar. 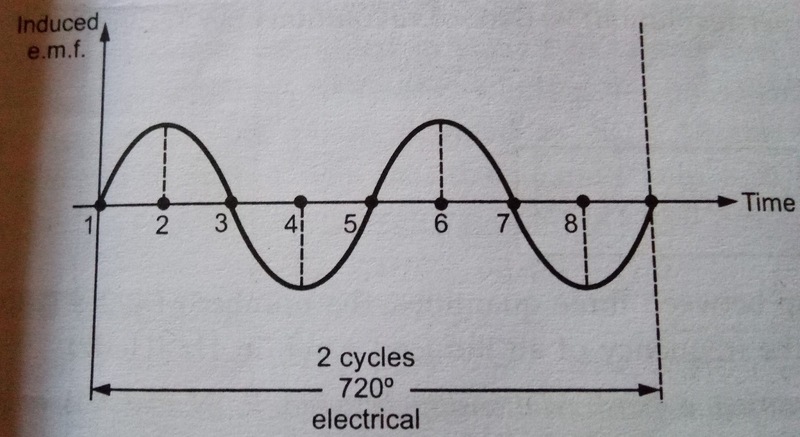 If the bulbs ON and OFF one after the other then the phase sequence is mismatching. 7. To change the connections of any two leads during the mismatch of phase sequence first off the alternator and change the connections. 9. If all the conditions required for synchronization are satisfied then the lamps will become dark. 10. Now close the switches of alternator -2 to synchronize with alternator-1. 11. Now the alternators are in synchronism. Flickering only says difference between frequency of voltages of alternator and bus bar but correct value of frequency of voltage of alternator cannot be found. For example, if the bus bar frequency of voltage is 50 HZ and difference in frequency of voltage of bus-bar and alternator is 1 HZ the alternator frequency of voltage can be either 49 HZ or 51 HZ. 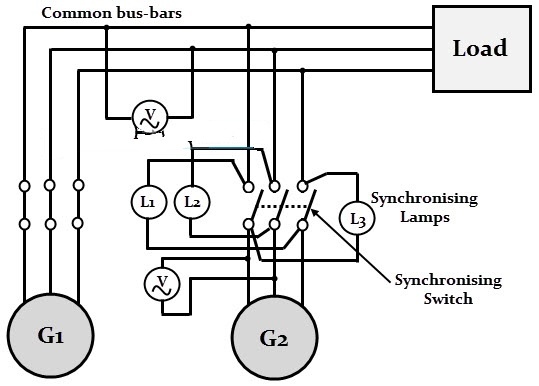 Let us discuss synchronization of alternator using two bright and one dark lamp method. 3. Here lamp L-2 is connected similar to the three dark lamp method. 4. Lamps L-1 and and L-3 are connected in different manner. One end of lamp L-1 is connected to one of the phases other that the phase to which lamp L-2 is connected and the other end of lamp L-1 is connected to the phase to which lamp L-3 is connected. 5.Similarly one end of lamp L-3 is connected to a phase other than the phase to which lamp L-2 is connected and other end of lamp L-3 is connected to the phase to which lamp L-1 is connected as shown in the following circuit. 6. To match the terminal voltage of alternator-2 with bus-bar voltage we need to adjust the field current of alternator-2 until terminal voltage of alternator-2 matches with the bus-bar voltage. The required value of voltage can be seen in the voltmeter connected to bus-bar. 7. Depending upon the sequence of lamps L1,L2, L3 becoming dark and bright we can decide whether the alternator-2 frequency of voltage is higher or lower than bus-bar frequency. 8. If the sequence of bright and dark of lamps is L1-L2-L3 then the frequency of voltage of alternator-2 is higher than the bus-bar voltage. Now until the flickering reduces to a low value decreases the speed of prime mover of alternator-2. 9. If the sequence of bright and dark of lamps is L1-L3-L2 then the frequency of voltage of alternator-2 is less than the bus-bar voltage. Now until the flickering reduces to a low value increase the speed of prime mover of alternator-2. 10. When the L1 and L3 are equally bright and lamp L2 is dark then close the switches. Phase sequence of the alternator cannot be checked by this method. Let us discuss synchronization of alternator using synchroscope method. 1. A synchroscope is used to achieve synchronization accurately. 2. It is similar to two bright and one dark lamp method and tells whether the frequency of incoming alternator is whether higher or lower than bus bar frequency. 3. This contains two terminals they are a) existing terminal b) incoming terminal. 4. Existing terminals are to be connected to bus-bar or existing alternator here in the diagram it is alternator-1 and incoming terminals are connected to incoming alternator which is alternator-2 according to the diagram which we have considered. 5. Synchroscope has a circular dial inside which a pointer is present and it can move both in clockwise and anti clockwise direction. 7. Depending upon the rate at which the pointer is rotating the difference of frequency of voltage between incoming alternator and bus-bar can be known. 8. And also if the pointer moves anti clockwise then the incoming alternator is running slower and has frequency less than the bus bar or existing alternator frequency and if the pointer moves clock-wise then the incoming alternator is running faster and has frequency greater than bus-bar or existing alternator frequency. So by adjusting the speed of prime mover of incoming alternator we can match the frequency with bus bar or existing alternator frequency. Frequency matches when the pointer is straight up-wards. At this point close the switch. 9. Now both the alternators are in synchronism. So by these three methods synchronization of alternators is checked. Today in this post we have learnt what is meant by synchronization of alternator and methods of synchronization of alternator. To download this post on synchronization of alternator and methods of synchronization of alternator as PDF click here. In this post let us see how to calculate voltage regulation of synchronous machine by M.M.F method or ampere turn method. 1. Any synchronous machine requires m.m.f to induce rated terminal voltage on open circuit. This m.m.f is denoted by Fo. To calculate this we conduct open circuit test on synchronous machine. 2. In the same way a synchronous machine also requires m.m.f to act opposite to armature reaction such that it helps full load current to flow in the armature.This m.m.f is denoted by Far.To calculate this we conduct short circuit test on synchronous machine. 3. From open circuit test on synchronous machine we obtain open circuit characteristics of synchronous machine and from short circuit test on synchronous machine we obtain short circuit characteristics of synchronous machine. For details about open circuit test on synchronous machine , open circuit characteristics of synchronous machine and short circuit test on synchronous machine , short circuit characteristics of synchronous machine refer below link. The graph shown below is the combined graph of open circuit characteristics of synchronous machine and short circuit characteristics of synchronous machine. 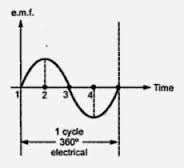 Note: As in many cases we don't know the number of turns though m.m.f is product of current and turns here we express m.m.f in terms of field current. What is meant by Fo and Far ? 1.Fo is the field m.m.f required to induce rated terminal voltage when the armature is open circuited. This value can be obtained from open circuit characteristics of synchronous machine by conducting open circuit test on synchronous machine. 2. 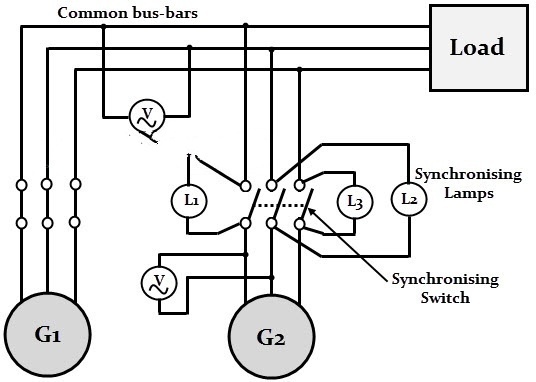 Synchronous impedance has two components namely synchronous reactance and armature resistance . 3. 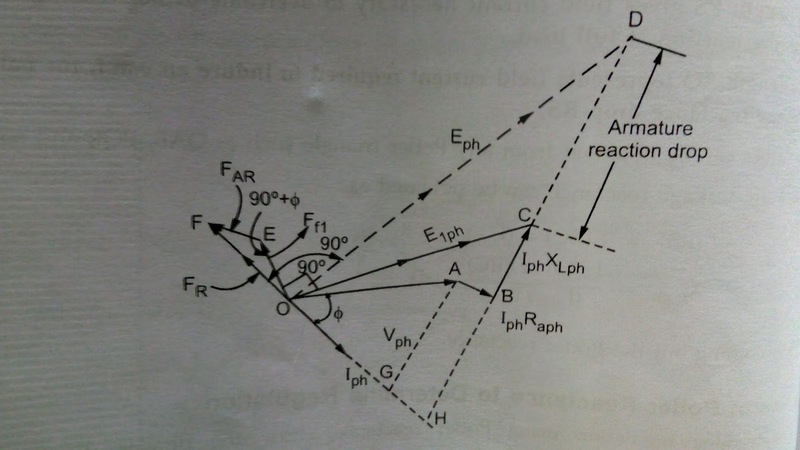 Synchronous resistance further contains two components namely armature leakage reactance and armature reaction reactance. 4. In short circuit test on synchronous machine field m.m.f is required to overcome drop across armature resistance, leakage reactance and armature reaction and allow full load current to pass through short circuited armature. But the drop due to armature resistance, leakage reactance is very small and can be neglected. So the m.m.f required to allow full load current to pass through short circuited armature by balancing armature reaction is Far which can be obtained from short circuit characteristics of synchronous machine by conducting short circuit test on synchronous machine. When the alternator supplies full load the total field m.m.f Fr is the vector sum of Fo and Far. And this depends on the power factor of load which the synchronous machine is supplying. 1. If the load has zero power factor lagging then the armature reaction is demagnetizing in nature. 2. So resultant m.m.f Fr is algebraic sum of two vectors Fo and Far. 3. So here field m.m.f should be able to provide not only rated terminal voltage but also it should overcome demagnetizing armature reaction. This shows total field m.m.f is greater than Fo. 1. load power factor is lagging and it is represented by cos𝞍. 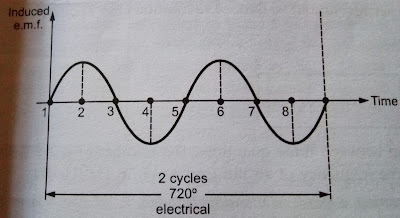 So draw phase current Iaph which lags Vph by an angle 𝞍. 2. 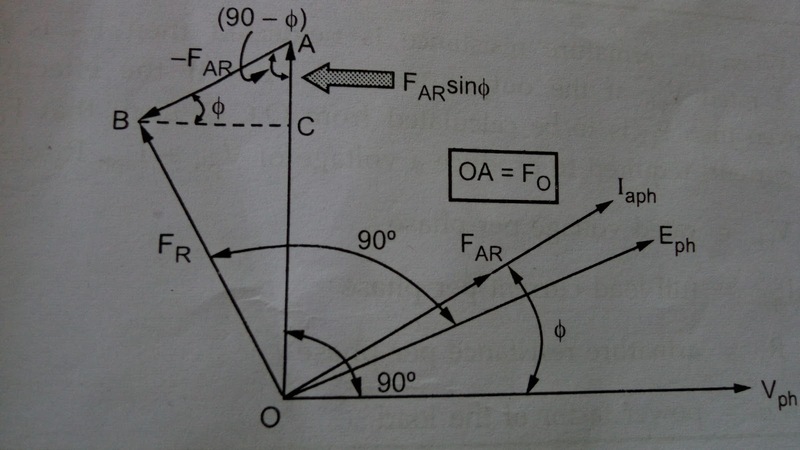 Fo is at right angle to Vph. 3. Far will be in phase with the Iaph because armature current Iaph decides armature reaction. 4. This Far has to be overcome by resultant m.m.f Fr which is also called field m.m.f so - Far should be added to Fo vertically so that Fr counter balances armature reaction and produce rated voltage. Hence, Fr can be calculated in this way. 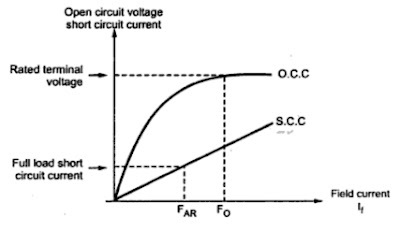 To calculate voltage regulation of synchronous machine by m.m.f method or ampere turn method draw the graph of open circuit characteristics of synchronous machine and short circuit characteristics of synchronous machine and indicate values of Fo , Far , Fr as shown below. 1. Calculate Fo value from open circuit test on synchronous machine and mark it on x - axis. 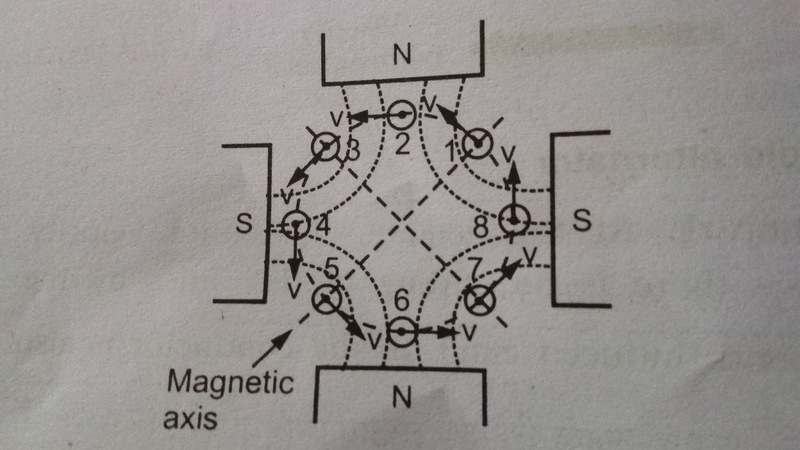 Now extend this point on to open circuit characteristics of synchronous machine curve and extend this point on y - axis which gives the value of Vph of synchronous machine. 2. Calculate Far value from short circuit test on synchronous machine and mark it on x - axis. Now extend this point on to short circuit characteristics of synchronous machine line and extend this point on y - axis which gives the value of rated Isc of synchronous machine. and and mark it on x - axis. 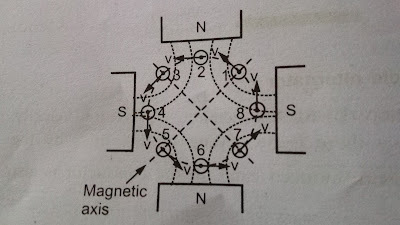 Now extend this point on to open circuit characteristics of synchronous machine curve and extend this point on y - axis which gives the value of Eph of synchronous machine. Voltage regulation% = (Eph - Vph / Vph) × 100. Hence in this way we have calculated voltage regulation of synchronous machine by m.m.f method or ampere turn method for lagging power factor load. 1. If the load has zero power factor leading then the armature reaction is magnetizing in nature. 2. This will help main flux to induce rated terminal voltage. 3. So net m.m.f is less than that required to produce rated voltage. 4. So net m.m.f is algebraic difference between the two components Fo and Far. This shows total m.m.f is less than Fo. 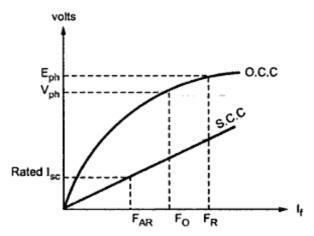 1. load power factor is leading and it is represented by cos𝞍. 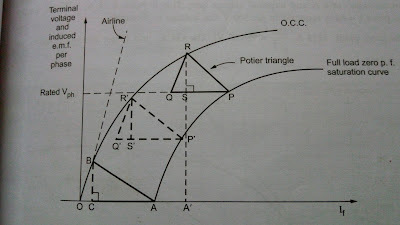 So draw phase current Iaph which leads Vph by an angle 𝞍. 4. Fr is obtained by adding - Far to Fo. So finally we get voltage regulation of synchronous machine by m.m.f method or ampere turn method for leading power factor load by using below formula. Hence in this way we have calculated voltage regulation of synchronous machine by m.m.f method or ampere turn method for leading power factor load. Vph = rated voltage per phase. Iaph = full load current per phase. Ra = armature resistance per phase. cos𝛟 = power factor of load. 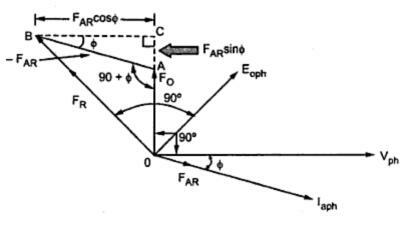 Resultant m.m.f Fr can be calculated from cosine rule for both lagging and leading power factor loads. In this way we can calculate Fr from cosine rule. Where Eph and Vph can be calculated from open circuit characteristics of synchronous machine and short circuit characteristics of synchronous machine as seen above. In this method drop due to leakage reactance is also considered as drop due to armature reaction so we get voltage regulation less than actual regulation. Hence it is called optimistic method. Today we have learnt how to calculate voltage regulation of synchronous machine by m.m.f method or ampere turn method . In the next post we are going to learn voltage regulation of synchronous machine by zero power factor method or potier method. You can download this post on voltage regulation of synchronous machine by m.m.f method or ampere turn method as PDF here.